When you attend a racist rally without your hood and cloak of anonymity, don’t be surprised when you’re outed as a white supremacist. But way to go in embarrassing your family members who don’t share your views. Pete Tefft of Fargo, N.D., wasn’t too hard to spot in the crowd, with his Vidal Sassoon hair and button-down shirt. Internet sleuths quickly identified him, and now his father is expressing his own embarrassment and is trying to convince people that he and his son don’t share the same views. 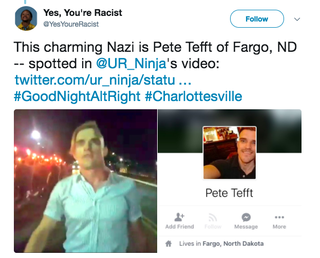 On Monday, Pearce Tefft wrote a letter, saying the family is completely against Pete’s white supremacist views. “I, along with all of his siblings and his entire family, wish to loudly repudiate my son’s vile, hateful and racist rhetoric and actions. We do not know specifically where he learned these beliefs. He did not learn them at home,” Pearce Tefft wrote. “I have shared my home and hearth with friends and acquaintances of every race, gender and creed. I have taught all of my children that all men and women are created equal. That we must love each other all the same,” he continued. Pearce went on to write that he now realizes it was a mistake not to speak out against his son publicly before. Pete Tefft doesn’t seem to care too much about his family’s feelings, but says he wishes people would stop threatening them. He said that he still plans to organize his own white supremacist rally in Fargo in October.